Recently I had to look into the details of port scanning and I started looking into the SYN Scan, as being one of the simplest, so-called stealth, port scanning techniques. The idea is very simple and it is very well explained in many places in the Internet. Let's just repeat it here for completeness. A SYN Scan, will send the SYN packet normally, but it will never send back the ACK to complete the connection (in the case that the port is open). What happens is that, we know the estate of the remote port just after receiving the first packet from the destination. If it is a SYN|ACK, the port is Open and we do not really need to complete the three-way-handshake. In other words we do not need to send the last ACK packet. If we receive a RST, then the port is closed and we are done. 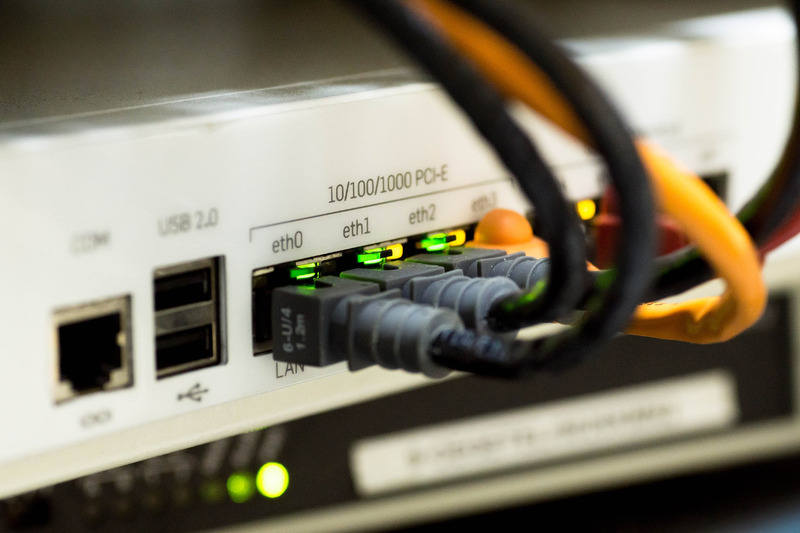 A real port scanner like nmap, considers a few more cases: Filtered packets not returning anything and host/networks unreachable errors manifested as ICMP packets received back by the port scanner. However, all this is very well explained in many different websites and I will not go further into those topics. A connect scan is much noisy than a SYN scan. I will go one by one through this list to try to figure out what is behind each of those claims. The first claim is that a SYN scan is a less noisy that a full connect scan. This is completely true but... what does it really mean?. After looking around for some time the conclusion I reached is that this is not as sophisticated as it may sound. This is a typical server program, that greets any client and.... LOGS its IP. The server can only get the IP of the client once the accept system call returns and that only happens whenever the connection is fully established. Let's see how our server behaves when scanned using a connect scan and a SYN scan. There you go. I bet this is the noisy thingy. It is at application level and it is the application who actually logs the IP. I will try an IDS (e.g. snort), but I will expect that an IDS can detect both scans without problems. You will read in many places around the Internet that a SYN scanner has to send a RST packet at the end. This claims comes from the fact that you will always see that packet if you sniff the traffic when doing a scan. This is the one and only packet sent by nmap during a SYN scan. You can parse it, or even easier, you can capture it with wireshark and match the contents and you will see that those hex numbers compose a TCP SYN packet. As you can see there is nothing else send out by nmap after the SYN packet. So, where does this RST packet comes from? Easy. It is generated by the local TCP/IP stack. The default behaviour of the stack is to reply with a RST packet to anything received that does not make sense (not exactly, but it can be taken as a behaviour baseline). Actually this is abused by other types of scanning techniques that wouldn't work otherwise. 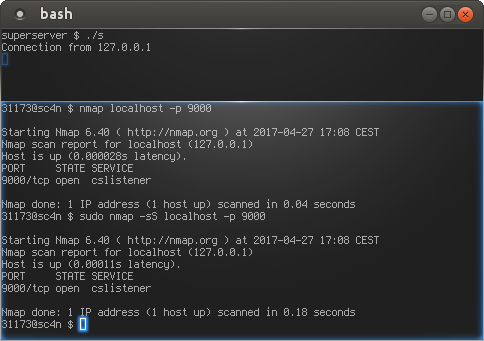 The port scanner does not really need to send the RST packet and actually nmap on a Linux box does not send it. In normal conditions, the local TCP/IP stack will produce the RST packet anyway, so your sniffer and the remote machine will see it. But, what will happen if that RST packet does not really reach the remote machine. The port scanner has to send a RST packet back to the victim to close the connection and avoid a potential DoS against the scanning machine. The basis for this claim is how TCP works. TCP is intended to make sure that the data is reliably transmitted and to achieve this goal it uses the store and resend approach. Let's see what does this mean. When the remote machine sends out the SYN|ACK packet in response to the connection attempt (the original SYN packet), the machine will store that packet in memory until the remote end sends back an ACK packet saying: "I have received your packet save and sound". If that ACKnowledge does not come within a certain time, the TCP stack will try to resend it and wait again for the ACK... just in case it got lost or dropped somewhere in its way. A RST packet is received indicating that ACK packet will never be send and the process has to stop. An ICMP message is received indicating some problem that prevents the message to be delivered... host/network unreachable...(it you disconnect the wire, there is nothing TCP can do :). Is this last case the one that the DoS claim refers to. However, it is a bit of an exaggeration. Let's see way. Will we really be DoSed? To find out if we will be DoSed when we do not send the `RST` packet we have to get a rough idea of the amount of traffic involved in the scanning process. To estimate this we need to know a bit more about how this retry process works. The TCP packet resend process makes use of a system parameter: The number of SYN|ACKs retries. These parameter can be checked at /proc/sys/net/ipv4. Taking into account that a SYN|ACK packet is 44 bytes (this is the minimum IP + TCP packet size). We will just get five 44 bytes long packets during a period of 24 seconds. However, the problem will arise when scanning big networks with many hosts up, each one running many services. A quick analysis shows that this is not really a DoS problem, but a complete waste of resources. Let's see why using some numbers. That's quite some data. And that is just generated whenever you press enter (Note: that scanning all ports on all host and having 255 hosts up is a bit of a extreme case...). Now, we have to assume that the machine running the scanner can cope with this data without problems... otherwise it will just get DoSed by the fact of kicking off the scanner. In this case we will just receive, exactly the same amount of data we had already received with our normal scan, 1 second later. Then 3 seconds later. Then 6 seconds later... and after 24 seconds it will just stop. Overall, the machine doing the scanning will receive around 60MB in 24 seconds. That is quite some data but, for nowadays standard, it is unlikely that such traffic will DoS even a normal Internet connection. In other words, the machine will receive the same traffic that would receive if 5 similar scans were launched in the next 24 secs. In normal conditions the amount of data coming back from the scanned network will hardly suppose a DoS. It is unrealistic that you scan a whole network were all the hosts are up and all of them have 1000 ports open. However, not sending the RST packet is a dirty solution as well as a waste of resources. Fortunately, the kernel will send the packet for us anyways :). Summing up, you do not have to send the RST but you should do it. We have gone into the details of many common claims we found in the Internet regarding SYN scans but that are not usually explained in detail. For me was interesting to see how, something that is mentioned all over the Internet as a trivial thing has some tricky details behind. Of course, I may be wrong on my analysis... so any feedback is appreciated.